By the end of March, we all just need the spring. We welcome the extra hours of daylight and milder temperatures with open arms. Unfortunately, ticks really love springtime weather too, and they’ve already started basking in its warmth all around us. This year, experts are suggesting that woods and grassy fields across the country will be filled with even more ticks than normal. 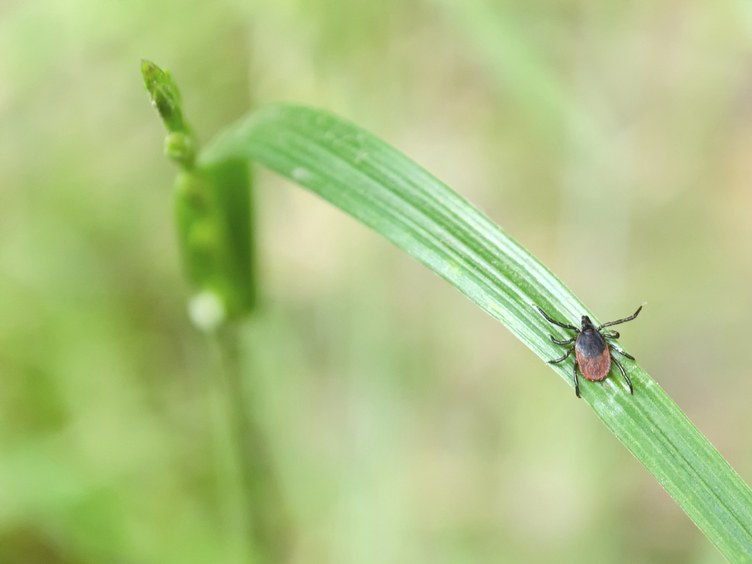 One TV news station in Massachusetts has even dubbed it a “tick apocalypse.” And that means that tick-borne illnesses, from Lyme disease to the dangerous (yet rarer) Rocky Mountain spotted fever, will likely be on the rise, too. The reason for the tick boom? Warmer weather, mice, and deer. Black-legged ticks (known commonly as deer ticks), which are the primary carries of Lyme and other tick-borne diseases, typically feed on mice and other animals like raccoons and skunks when they’re developing. As adults, they move onto deer, where they ultimately lay their eggs. This past year, we’ve had an increase in mice in our country, Jorge P. Parada, M.D., M.P.H., medical advisor for the National Pest Management Association and medical director of the Loyola University Medical System Infection Control Program in Chicago, tells SELF. “Last year seemed to be a big year for mice. The projection is that we’re going to have high tick populations [this year] because there are high mice populations,” he says. He notes there are also some studies that show when mice populations are up, there tends to be an increased transmission of Lyme disease the following year. The deer tick also transmits other illnesses, so those transmission rates will probably increase as well. There’s also been an increase in deer over the past few years, which can also have an impact. “We have an increasing population of white tail deer in the U.S., so we’re seeing increasing numbers of ticks,” Catherine Hill, Ph.D., professor of medical entomology at Purdue University, tells SELF. Ticks can survive through the cold winter, but warmer climates allow hosts (and therefore, ticks) to travel further geographically—to areas that may have been too cold in the past. “There can be year-upon-year variation, but it’s been very clear over the last two decades that due to climate change, the area that ticks can inhabit has been spreading,” Parada says. Specifically, northern parts of the country and Canada are seeing more ticks than ever before. Despite what you might think, Lyme disease isn’t the worst thing you can get from a tick. “There’s a million things you can get from a tick,” Parada says, all caused by bacteria and parasites the tiny bugs carry. Scientists are discovering new tick-borne infections all the time, but many are so new and so rare that they’re still figuring out what they really are. The most well-known tick-borne illness is primarily transmitted by the black-legged (deer) tick, “but there are also pockets on the west coast where the western black-legged tick transmits it,” Parada says. Symptoms are flu-like, including fever and chills. Lyme is also marked by its signature rash that looks like a bulls-eye. “You can think of this as tick malaria,” says Parada. It’s caused by a parasite that infects and kills red blood cells. It causes fever and fatigue, but can occur without symptoms. It’s usually transmitted by the black-legged tick, and prevalent in parts of the Northeast and upper Midwest. This infection is caused by bacteria that impact white blood cells called granulocytes. “We see this more in the center of the country, and it’s being reported more and more,” Parada says. This is also transmitted by the black-legged tick and the western black-legged tick. He credits the fact that ticks are spreading out, but also that it’s simply more recognized these days. Still, it’s a relatively rare infection. Symptoms are flu-like—fever, headache, fatigue, nausea, and muscle ache. The symptoms are very similar to anaplasmosis. Ehrlichiosis is caused by a few different types of bacteria. It’s typically carried by the lone star tick and is most frequently reported in the southeastern and south-central U.S., according to the CDC. This is also known as rabbit fever. It’s caused by a bacteria primarily carried by the American dog tick, the lone star tick, and the wood tick. “If you stick your finger right in middle of the U.S., you’re in tularemia territory," Parada says. A lot of hunters get it directly from infected animals, like rabbits and rodents. The CDC notes it’s also common for domestic cats to get it and transmit it to humans. “Contrary to its name, there’s a focus near Utah but the vast majority is transmitted in Virginia, North Carolina, and South Carolina,” says Parada. It’s mostly transmitted by the American dog tick and wood tick. “This is the most serious tick-borne disease in the U.S. This is the one that is most likely to kill somebody if they’re not diagnosed in time,” Parada stresses. It starts with flu-like symptoms, and then in later stages, causes a red, spotted rash (in many, but not all, cases). By the time the rash comes out, “you’re in big trouble,” Parada says. The good news: It’s really easy to get treated for a tick-borne disease. If you’re not feeling well and have recently been in a wooded or grassy area, see a doctor. A round of antibiotics (usually tetracycline) typically knocks out any of the above, Parada says, although some can end up with chronic Lyme disease, also known as post-treatment lyme disease syndrome. Any infection can be dangerous for the elderly and those with another health condition, so getting treated early on is important. To prevent tick-borne disease? Be aware, Hill says. Wear light-colored clothing when you’re in a tick habitat, so you can spot them crawling on you before they find skin to cozy into. Wear bug repellant with DEET, and tuck your shirt into your pants and pant legs into your socks when you’re walking in high grass. “As soon as you come indoors again, do a tick check. They roam around and find a place to attach and it takes them a while, about 24 to 48 hours, to begin feeding and transmitting pathogens," Hill explains. "If you catch them before, you really lower your chances of acquiring a tick-borne disease." The best way to remove an already-attached tick is to grab it behind the mouthparts with tweezers and pull gently and steadily until the tick releases its hold, Hill says. Wearing latex or another type of glove can help prevent spreading any contaminated fluids. Then, wash your skin with warm soapy water and swipe with rubbing alcohol to kill any lingering bacteria.